Ross Honsberger credits the simple proof below to John Rigby. 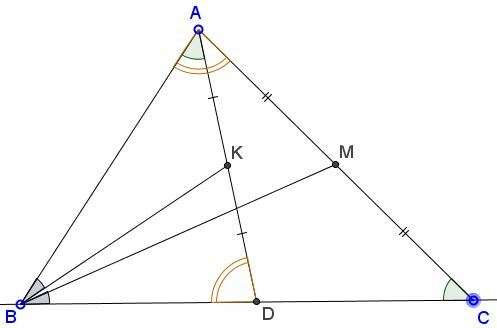 Note that, as a consequence, the altitude to the hypotenuse in a right triangle is simultaneously the symmedian from the right angle, as was discussed independently elsewhere. By the same argument as above, triangles $ABC$ and $ABD$ are similar, and the midpoint $K$ of $AD$ serves as the Lemoine point of $\Delta ABC.$ It follows that if $AD$ is the altitude from $A$ the angle $BAC$ (being equal to $\angle ADB)$ is right. The characterization of right triangles discussed above and the reference to Ross Honsberger's book have been posted by Vladimir Nikolin at CutTheNotMath facebook page as a comment to another characterization of right triangles posted there.